Originally recorded as one long Japan On Fire 19, it is now re-edited into a shorter episode and second half of the long recording will feature in Japan On Fire 20. 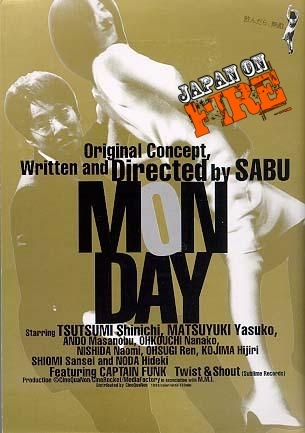 This is part 2 of our series on director Sabu after covering his first two movies Dangan Runner and Postman Blues in episode 18 of Japan On Fire. His characters ran and rode on bikes amidst droll, quirky and absurd humour as well as drama in the first two and not a lot changes as we look at Monday from 2000. Does Sabu still evolve though? With Kenny B and VCinema‘s Coffin Jon.